Interstate 90 leading away from the west end of Business Loop I-90 and Alberton toward Plateau. Photo taken September 1, 2006. Entering the state at Lookout Pass in the Bitteroot Mountains, Interstate 90 follows the original course of U.S. 10 southeast to St. Regis and Missoula. 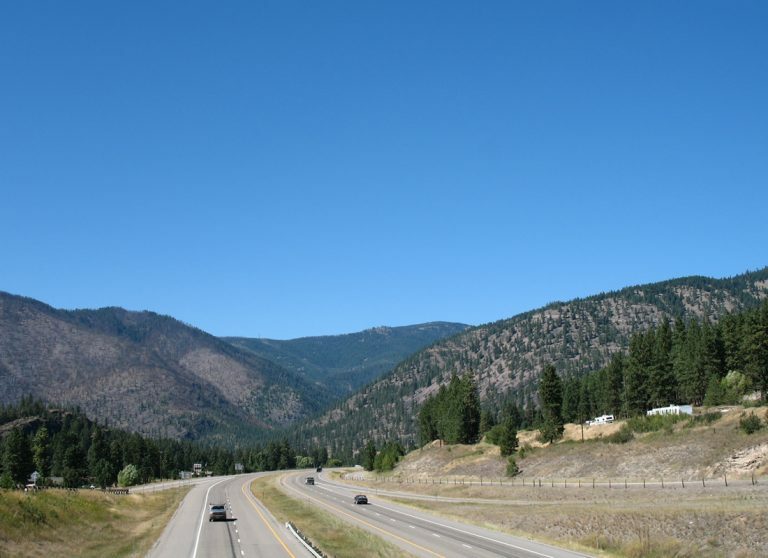 The freeway combines with U.S. 93 and Montana 200 through Missoula, and with U.S. 12 from Montana's second largest city eastward to Garrison. Interstate 90 hooks southward from Garrison to Butte and Silver Bow County, where the freeway shares a 7.556-mile overlap with Interstate 15. Interstate 15 joins Butte with Dillon and Pocatello, Idaho to the south and the capital city of Helena and Great Falls to the north. East from Butte, Interstate 90 remains along the former U.S. 10 corridor to Whitehall, Three Forks and Bozeman. U.S. 191 joins the route between Bozeman and Big Timber and U.S. 89 for seven miles at Livingston. 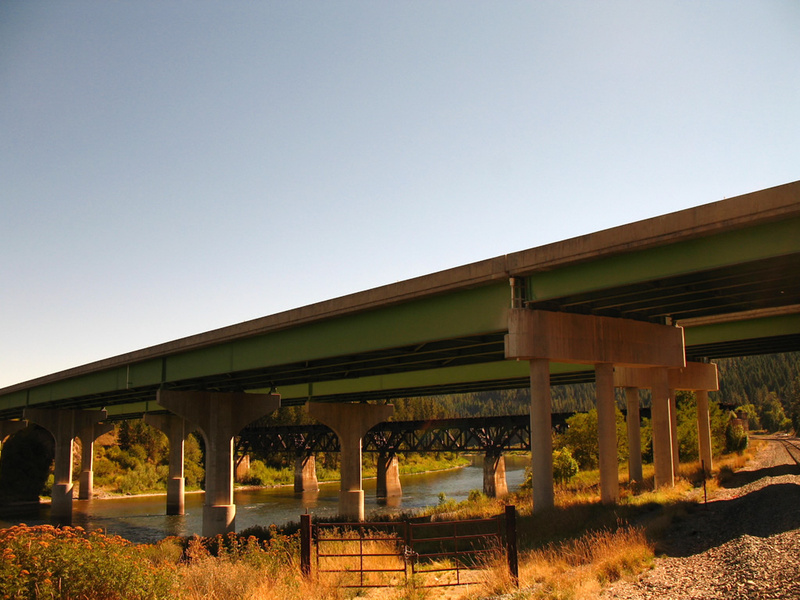 Continuing east along the Yellowstone River, Interstate 90 reaches Columbus, Laurel and Billings, where Interstate 94 splits and follows old U.S. 10 to Miles City, Glendive and Bismark, North Dakota. Interstate 90 enters Montana's largest city with U.S. 212 and exits it with both U.S. 212 and U.S. 87 to Hardin and the Crow Indian Reservation. Interstate 90 turns south from Hardin, remaining cosigned with U.S. 87 to Sheridan and Buffalo, Wyoming while U.S. 212 peels away from the freeway south of Crow Agency for Lame Deer and Broadus. I-90 concludes a 552.364-mile cross-state journey south of Aberdeen through hilly grasslands. Waters of the Clark Fork river flow northward below Interstate 90 at St. Regis. Old U.S. 10 parallels this bridge to the north while an abandoned railroad bridge remains in place to the south. Photo taken September 1, 2006. A trailblazer directs motorists from Broadway Street (former U.S. 10-93 and Montana 200) westbound onto Airway Boulevard for Interstate 90 by Missoula International Airport. Traffic lights were added to this intersection by 2012. Photo taken 09/01/06. Airway Boulevard comprises a half mile arterial between Broadway Street and the Exit 99 diamond interchange with Interstate 90. Midway between the two is Expressway, an east-west through road serving a number of traveler services and residential developments. The at-grade intersection pictured here between the two was converted into a roundabout in 2011. Photo taken 09/01/06. Airway Boulevard splits into ramps for Interstate 90 east into Missoula and west to Coeur d'Alene, Idaho. The freeway doubles as U.S. 93 between the next west and east exits and Montana 200 from Exit 93 to 109 and Bonner. Photo taken 09/01/06. Van Buren Street meets Interstate 90 at the split/merge with U.S. 12 (Exit 105) in Missoula. U.S. 12 exits the freeway for Van Buren Street south to Broadway Street west as the freeway circumvents the city center west to Orange Street to U.S. 93 (Reserve Street). Photo taken 09/01/06. Interstate 90 & Montana 200 continue west toward Missoula International Airport and a split 12 miles to the west. I-90 continues from there to Coeur d'Alene, Idaho. Photo taken 09/01/06. The westbound on-ramp for Interstate 90 & Montana 200 west departs Van Buren Street as U.S. 12 turns south from the Exit 105 off-ramp. Van Buren Street also carries Business Loop I-90 west to Broadway Street (former U.S. 10 & Montana 200). Photo taken 09/01/06. Montana Highway Department. (1967). The Center line: Montana Highway Commission. Helena, MT.